Kristen Stewart and Cate Blanchett went twinsies at Cannes! The two actresses, who are fellow jurors at this year’s film festival, both donned pastel pantsuits, cute sunglasses and Aquazzura heels for their jury photo call along the French Riviera on Tuesday afternoon. Kristen Stewart and Cate Blanchett at photo call for jury members held during the 2018 Cannes Film Festival in Cannes, France, on May 8, 2018. Taking a closer look at Kristen’s ensemble, the 28-year-old actress was outfitted in a baby-blue boucle suit from the Chanel Resort 2019 fashion show that she sat front row in just last week. She tucked a white Re/Done tank top into the high-waisted pants, which added a touch of her own tomboy style to the otherwise formal pantsuit. The “Cafey Society” star was still rocking her odd rat-tail and messy-top hairdo that she debuted on the Cannes Film Festival Opening Ceremony red carpet. A fresh, white pair Aquazzura “Casablanca” sandals that we last saw on Mandy Moore rounded out Kristen’s pastel look. Kristen Stewart wearing a Chanel Resort 2019 high-waisted suit with Aquazzura “Casablanca” sandals at a photo call for jury members held during the 2018 Cannes Film Festival. Kristen Stewart’s feet in white Aquazzura “Casablanca” sandals. Cate Blanchett was the pink to Kristen’s blue in a bespoke Stella McCartney pantsuit. Although we find Cate’s pants to be a tad too tight and too short on her, we can only gush over her adorable Andy Wolf “Grace” cat-eye sunglasses. 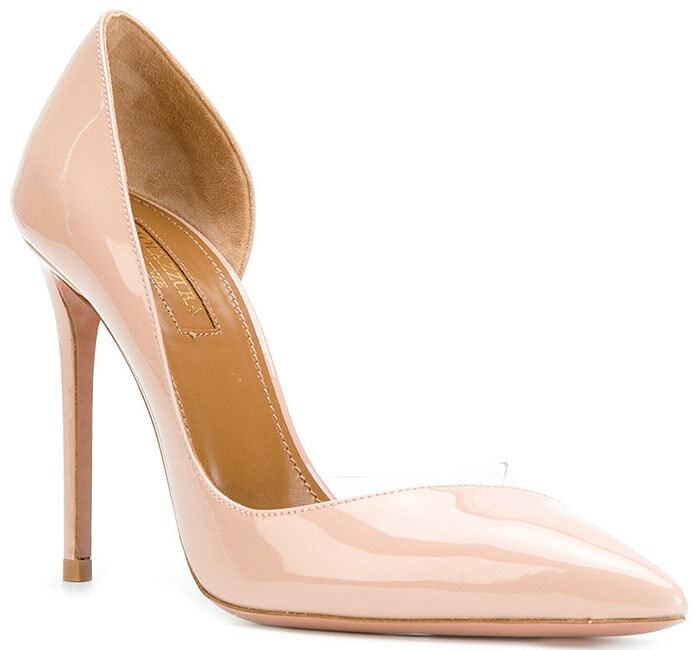 Powder-pink Aquazzura “Eclipse” PVC-and-patent pumps perfectly matched the Australian actress’s look. Cate Blanchett wearing Andy Wolf “Grace” pink cat-eye sunglasses. 2018 Cannes Film Festival Jury President Cate Blanchett in a bespoke pale-pink Stella McCartney pantsuit, Aquazzura “Eclipse” pumps, and Andy Wolf sunglasses. Cate Blanchett’s feet in powder-pink Aquazzura “Eclipse” PVC-and-patent d’Orsay pumps.